I recently paid a rather obscene price to get myself this bottle of Enchanted Polish Austin Powers. I knew from the moment I saw it last year some time, that should I ever see someone selling their bottle, I would have to get it. 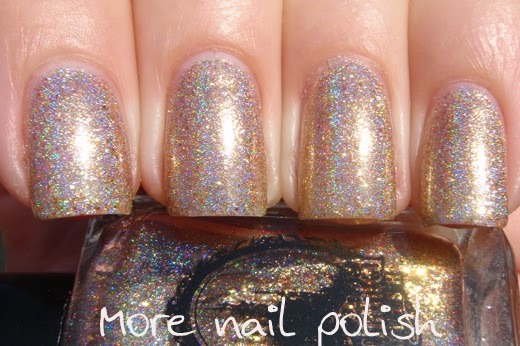 I don't have any regrets, because it's certainly is a magical gold holographic polish, and when it comes to gold polish, I just can't help myself buying them. But it was only after I had this little beauty in my hand that it looked really similar to another polish I had, in fact, dupe worthy similar. But lets first look at EP AP. 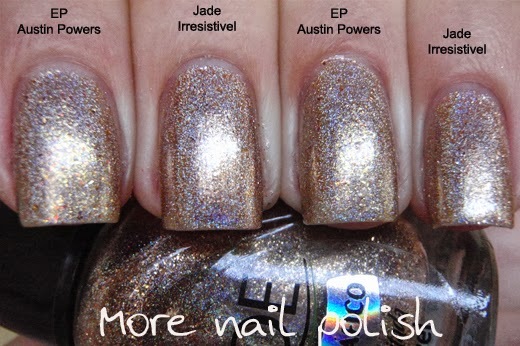 Enchanted Polish Austin Powers is a gold holographic polish that has gold flecks and small copper hex glitters. 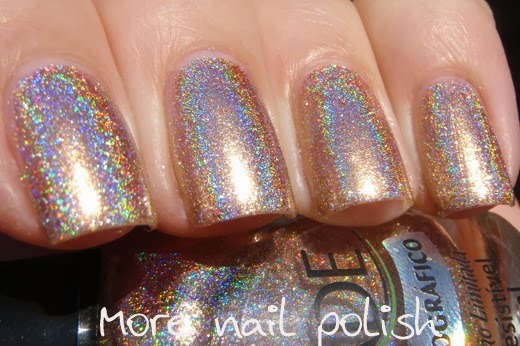 You can wear it alone as I did and it is opaque in two coats, you can also layer it over anything. You can see it layered over black at the Swatchaholic. Ah-maze-ing!. OK, now it's time to check out the dupe. 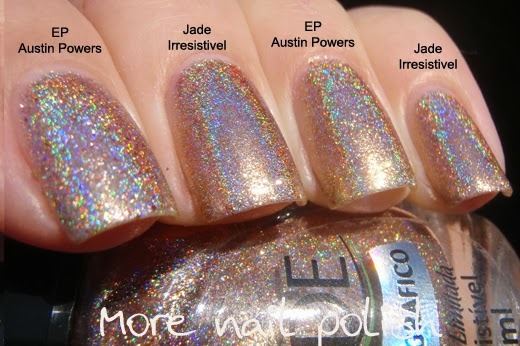 This is Jade Holographico Irresistivel, which I purchased from Ninja Polish for just US$7 (just a tad under what I paid for EP AP). 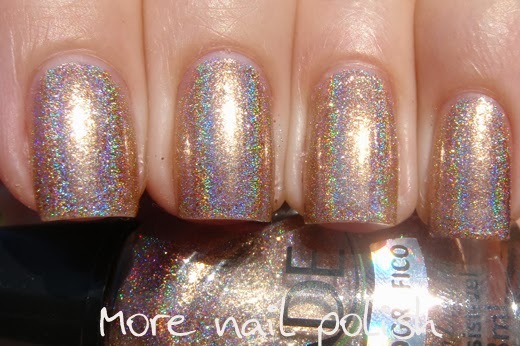 It's a linear holographic polish with gold and copper glass flecks. Want some side by side comparisons? OK. As you can see the colour on these two polish is nearly identical. I say nearly, because when you look a the photo in the shade, you can see that Austin Powers is slightly yellower and Jade Irresistivel leans pinker. And while Irresistivel doesn't have the copper glitters, it does have some copper flakes that give that multi toned gold appearance. 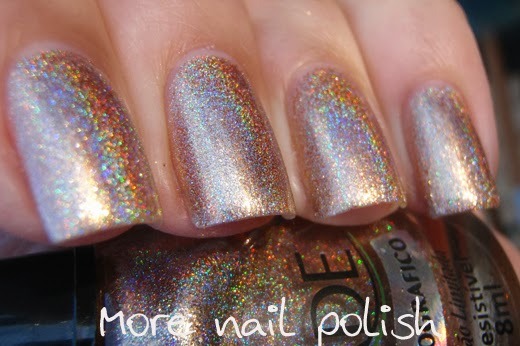 The holo flame in both polishes is indistinguishable to my eyes. So what you you guys think? 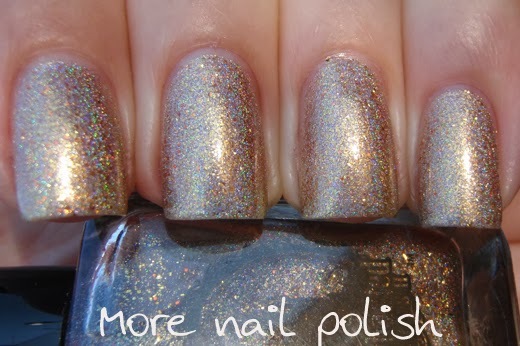 Does this look like a pretty damn good dupe of one of the most expensive indie polishes going around at the moment? And to think it's only $7! The other thing that cracks me up is that the Jade polish only has a review rating of one and a half stars out of five on the Ninja polish site! 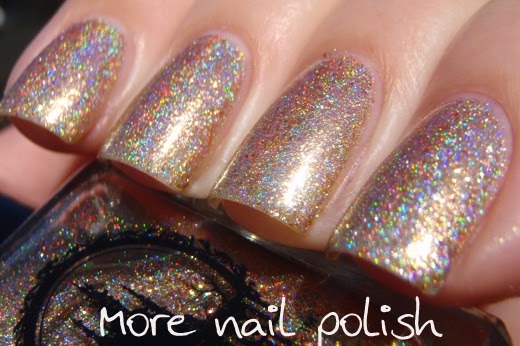 I think this just goes to show how a brand name around a polish generates the hype. 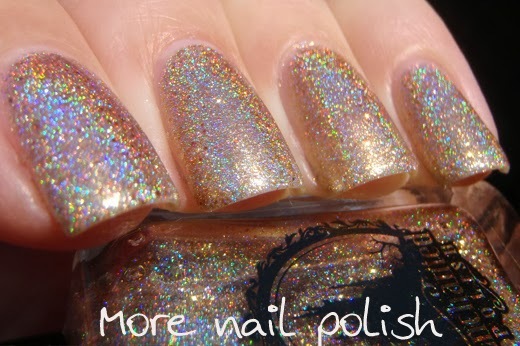 You know I've even googled "Enchanted Polish Austin Powers Dupe" many times before hoping to find a dupe of this polish. I wonder why no one ever spotted this dupe pair before! 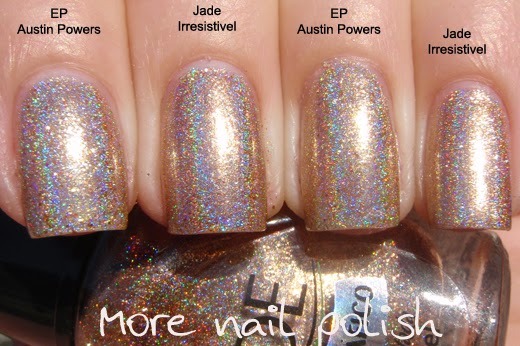 In case you want to grab yourself a bottle of this close dupe to Enchanted Polish Austin Powers, here is the direct link to Jade Irresistivel on the Ninja Polish site. 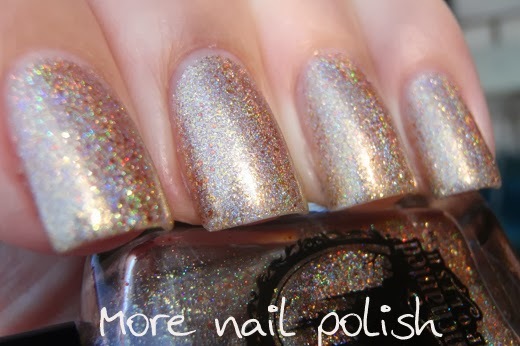 oooh really nice dupe - I may need to invest! That is an awesome discovery! Both look pretty much the same to me. Well isn't that something! Let me say that I love Jade polishes. I also love the EP's but I have slowly realized this brand and I aren't meant to be given the expense and difficult nature to obtain. This was even before Llarowe dissolved their partnership because of all the negativity around the EP restocks. 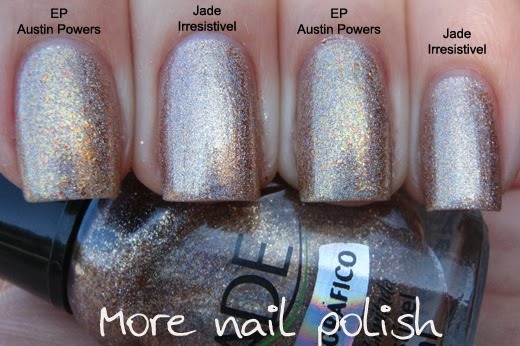 I'll take the dupe and keep it moving, but I'd also point out that Jade polishes are some of the most flawlessly formulated and gorgeous polishes I've used and unbelievably priced in terms of a holographic (mainly) brand! That is a fabulous comparison and the Jade is well worth searching out but I wanted to mention that my Jades have a very strong chemical odor that aggravates my asthma. That might be part of the reason they have a low rating? Great comparison but I would justify having both just because like I say "they're alike but not totally identical!" 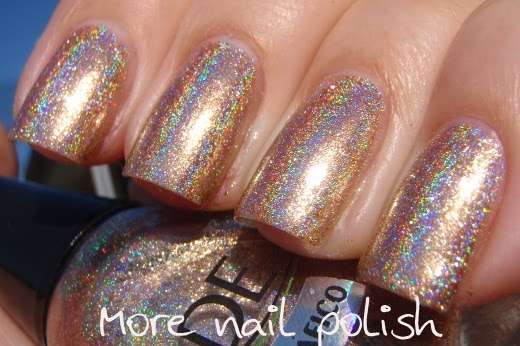 I love seeing a good dupe for a Enchanted Polish! They are so hard to get your hands on! I have been lusting after Afternoon Delight for awhile now, and just like you I have searched Google for dupes of it, and no one seems to have any...so sad. Thank you for this comparison! Do you know if it's 3-free or not? I seriously think that some people don't want to find a dupe to the EPs. If you're trying to resell it on ebay for hyperinflated prices, it would not be in your best interest to look for a cheaper dupe. Likewise, if you paid a large sum for an EP, it might actually choke you to find a much cheaper dupe The people looking for dupes are the ones who can't get the polish they want because of heart attack restocks but refuse to pay high prices for it. These people pursue all kinds of possible dupes but can never know for sure that it is a dupe since they don't own the EP to compare it to. So I thoroughly applaud you for posting this. You are one of the few perhaps who want a cheaper back up or are real honest and just want to help nail addicts everywhere. Thank you. You are awesome. Oh wow! thank you for doing a post on this. I have EP austin powers but wanted a backup which of course i couldn't find :). I got irresistivel from llarowe as a backup and i'm amazed at how similar the two are. 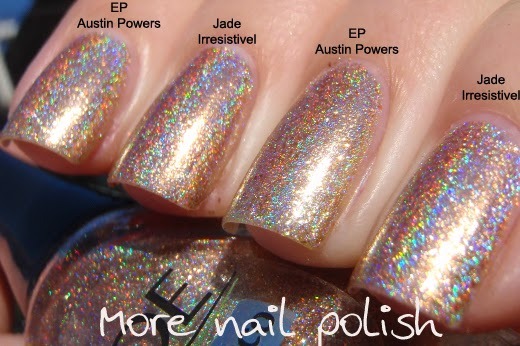 And while this is my most favorite holo polish shade, it does seem unfair how Austin powers is rated as one of the best polishes ever and irresistivel is like always the last to sell out at stockists :). thank you!